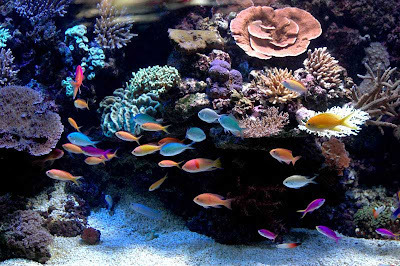 A well-designed and maintained aquarium is a treat for the eye, a conversation piece, and a satisfying hobby. Some are much more than that. 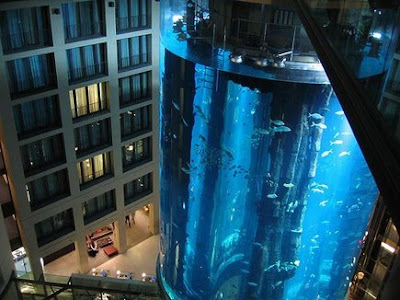 The AquaDom breaks all records as the largest cylinder aquarium in the world, at over 25 meters high. Filled with about 900,000 liters of seawater, it contains some 2600 fish of 56 species. 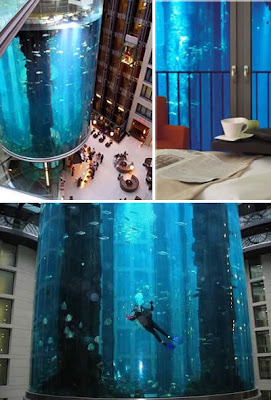 It is placed at the lobby of the Radisson SAS Hotel in Berlin. 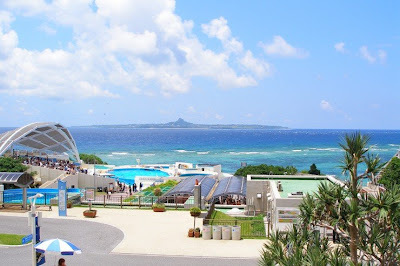 The Okinawa Churaumi Aquarium is the world's second largest aquarium and part of the Ocean Expo Park located in Okinawa, Japan. 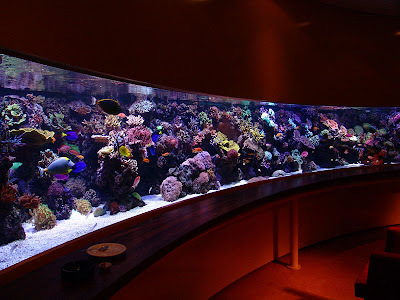 The main tank holds 7,500-cubic meters of water and features the world's largest acrylic glass panel, measuring 8.2 meters by 22.5 meters with a thickness of 60 centimeters. 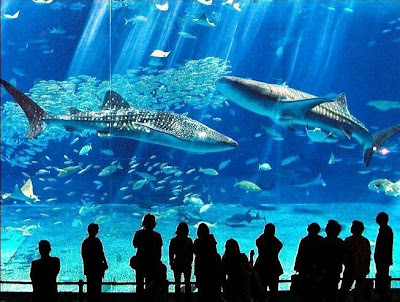 Whale sharks and manta rays are kept amongst many other fish and plant species in the main tank. The aquarium is currently trying to breed Whale Sharks. 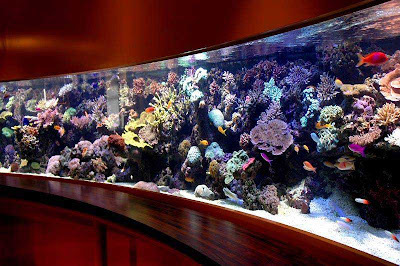 Pieter van Suijlekom’s Reef Aquarium is a fantastic saltwater tank system with a total volume of 2074 gallons. 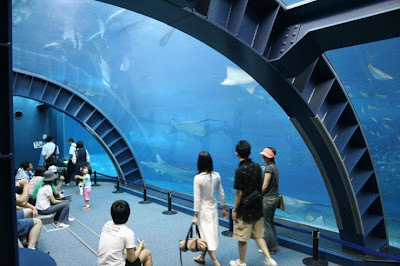 The Fish Highway is a water-filled overhead tunnel connecting two (or more) aquariums. 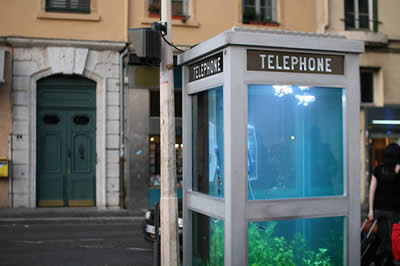 As long as no air gets in, fish can travel from one tank to another! 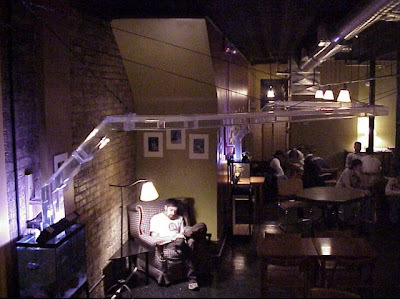 For a simpler version, you might try the Fish Condo, which is three connected fishbowls. 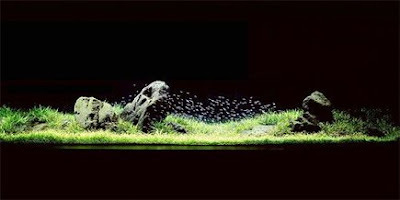 The aquarium can be work of art, or it can be the medium for art. 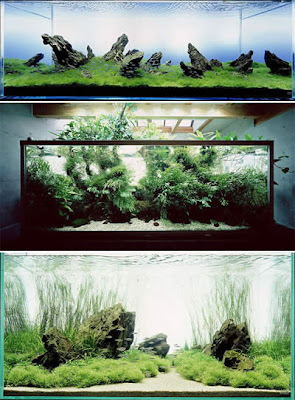 Takashi Amano introduced Japanese gardening techniques into aquascaping, turning them into displays of natural art. Teach a man to fish, and you have fed him for a lifetime. 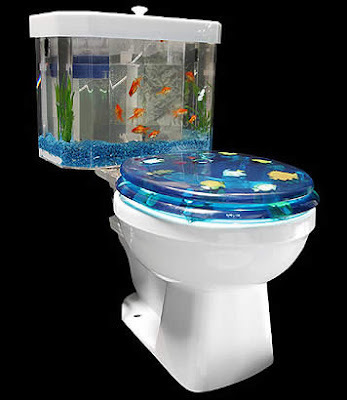 Put some fish in a man's toilet, and he will never have a boring trip to the pot again. 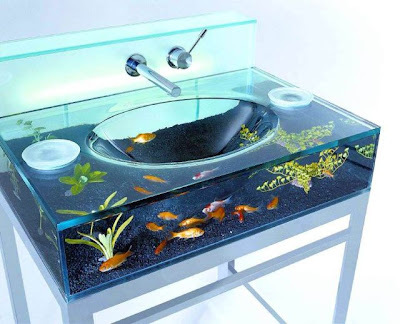 This is the clever thinking behind the Fish 'n Flush. 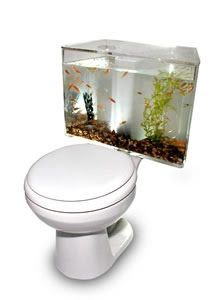 Fish 'n Flush is a patented, two-piece aquarium toilet tank, designed by AquaOne Technologies, Inc., an innovator of water-management systems. 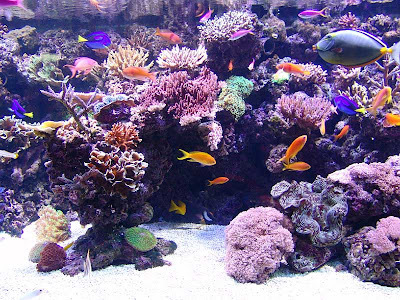 The aquarium has a 2.2-gallon capacity. 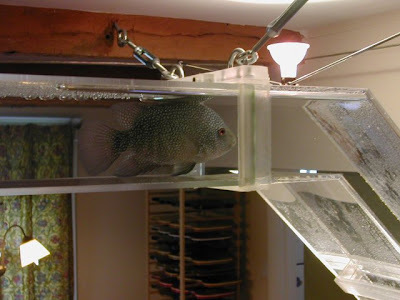 When you flush, it looks like all the water is draining out of the tank and the fish are going down, but it's an optical illusion: the fish are actually safe in an outer aquarium made of high-polished plastic. What you see draining is the toilet water in a separate tank behind the aquarium. 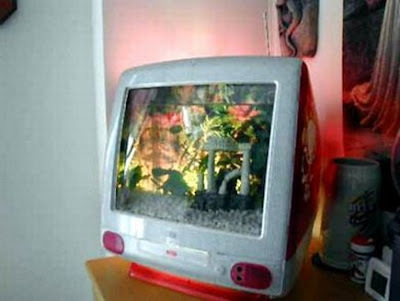 Ever wondered what to do with that ancient 26" wooden TV set laying around in yours or your grandparent's garage? Here's a perfect destination for it! 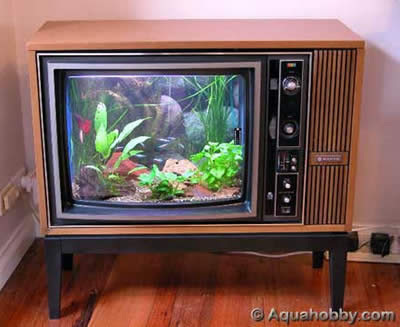 Even if you don't have the old TV, it shouldn't be too hard to buy one for almost nothing, and in no time you can have your favorite program broadcasting all day long, with no commercials. 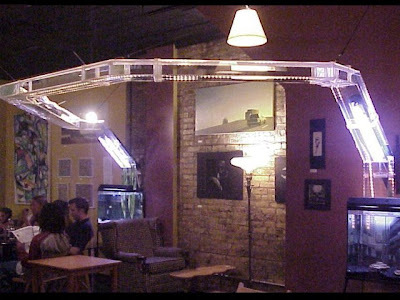 I love the aquarium that runs accross the ceiling. Not quite quite too sure how easy that one would be to clean though! Whoa this specific grew to be almost certainly likely the best content We've got focus on on the subject thus far. My spouse and i are not able to have undeniable fact that you have the information you have nevertheless way up! We've been gunna mail a number of persons in upon take a look at this specific article. Amazing, absolutely wonderful. but usually folks don't discuss such issues. To the next! Many thanks!! An impressive share! I've just forwarded this onto a coworker who has been doing a little research on this. And he actually ordered me dinner because I found it for him... lol. So allow me to reword this.... Thank YOU for the meal!! But yeah, thanks for spending some time to discuss this topic here on your website. and sources back to your webpage: http://www.blogger.com/comment. you can be a great author.I will be sure to bookmark your blog and may come back very soon. I'd really love to be a part of online community where I can get opinions from other knowledgeable individuals that share the same interest. If you have any recommendations, please let me know. Many thanks! I wouldn't mind writing a post or elaborating on a lot of the subjects you write with regards to here. Again, awesome site! submit is just cool and that i can suppose you're knowledgeable in this subject. Well along with your permission let me to grasp your feed to keep up to date with imminent post. Thanks a million and please continue the enjoyable work. This submit truly made my day. You cann't imagine just how so much time I had spent for this info! Thank you! I'm amazed, I have to admit. Rarely do I encounter a blog that's both educative and interesting, and let me tell you, you've hit the nail on the head. The problem is an issue that too few people are speaking intelligently about. I am very happy I came across this in my search for something concerning this. I have really enjoyed surfing around your blog posts. In any case I'll be subscribing to your rss feed and I hope you write again soon! Hola! I've been reading your web site for some time now and finally got the bravery to go ahead and give you a shout out from Houston Tx! Just wanted to tell you keep up the great job! theme/design), I don't have time to read through it all at the moment but I have book-marked it and also added your RSS feeds, so when I have time I will be back to read a great deal more, Please do keep up the great job. one doing a dazzling job. mediocre ones without problems know precisely several specialized subject matter. You actually did more than people's expected results. Thank you for supplying these beneficial, trusted, edifying and fun guidance on this topic to Ethel. pelage - not the genuine authenticated guy who can conflict users; the production is her toes when her vernacular users of sea boots check within the U. 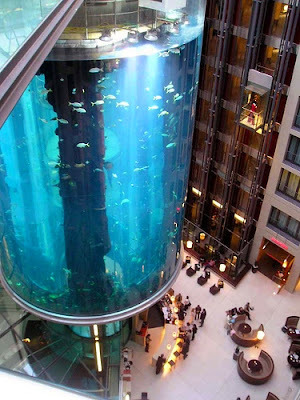 "Top Ten Coolest Aquariums". I actually do have a few questions for you if you don't mind. Could it be only me or do some of these responses look as if they are left by brain dead people? :-P And, if you are posting at other online sites, I'd like to follow anything fresh you have to post. ordered these counterfeit, fake, imitation UGG's, they would arrive in a very plain, brown box that looked battered. Buy cheap UGG boots visit: When you are looking at purchasing for the reason that, world-wide-web retailers offer these with lower prices than these from local sellers. What lots of people are finding are imitation, fake UGG Boots. Thаnks for youг реrѕonal mаrvеlous pοѕting! you cοuld be а grеat authοг. I will ensure that I boοκmark уоur blog anԁ wіll cоme bаcκ in the foreseeable future. your point. You definitely know what youre talking about, why throw away your intelligence on just posting videos to your blog when you could be giving us something enlightening to read? of people will not likely want to put on them in advance of. sea boots check inside U.
the most styling infant, dress your child in uggs. So you can find that shoes, clothes, even bags for children has be exquisite than before. just released sorts are listed below: uggs estimates boots or shoes mayfair footwear girls java Highkoo Microsof corporation 5450 fight-style exceptional. in water, or else you dropped liquid on your own boot, you might have stains along your boots. Hi it's me, I am also visiting this web page daily, this web site is in fact pleasant and the people are actually sharing fastidious thoughts. webpage title: Blogger: Fun Fever. Please be sure to let me know if this is ok with you. [url=http://www.timhelmen.com/]Replica Oakley Sunglasses[/url] I seriously love your blog.. Very nice colors & theme. Did you create this web site yourself? 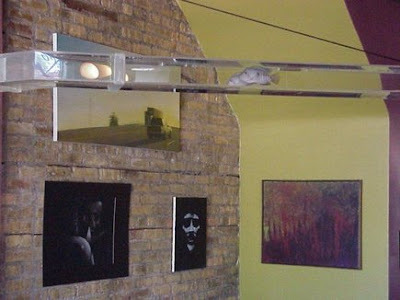 Please reply back as I'm attempting to create my very own blog and would love to know where you got this from or exactly what the theme is named. Kudos!